Taking food away from C. elegans in larval stages suspends their development; while they still wiggle around and look for food, they are in a state of arrested development. However, when food becomes plentiful again, they start to develop normally – but live twice as long. This remarkably simple way of achieving longevity is not entirely surprising. It has been known for quite a while that a low intake of nutrients and reduced cellular activity are generally linked with longevity – but doubling the lifespan only through a strict but temporary diet, that’s something quite surprising. Sherwood and his colleagues from Duke University took a myriad of creatures and deprived them of food, in order to study the effects on longevity. They studied rats, mice, yeast, flies, spiders, fish, monkeys and worms; the effects on longevity varied between 30 percent to 200 percent, but in all cases, the lifespan was increased. Caenorhabditis elegans, a non-parasitic worm showed the most promise. 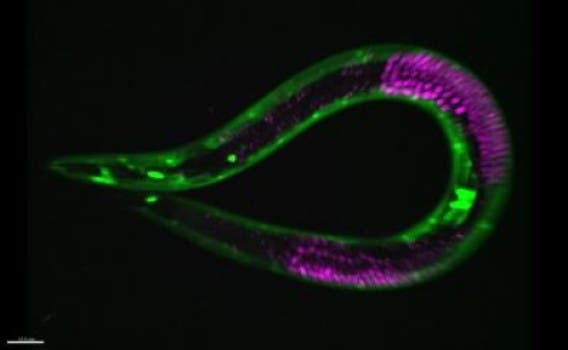 In nature, C. elegans often suffers from hunger, and its bodily development heavily depends on the available nutrients. But what researchers observed was that during the later stages of the larval development (known as L3 and L4), if they don’t have enough nutrients, they just stop developing. It’s as if they simply pause or slow down their development until they have sufficient nutrients around. Researchers starved the larvae for two weeks, and then fed them nutrients they would stumble upon in nature. What they observed was that the worms would develop normally after that – with their lifespans drastically increased.